I turned off the car when I saw my Dad sit down on the bench next to his homeless friend. I took it as a sign that we’d be waiting for a while. When I looked at Dad in the mirror I couldn’t help but see myself too. I liked what I saw in him; I didn’t like so much what I saw in myself. 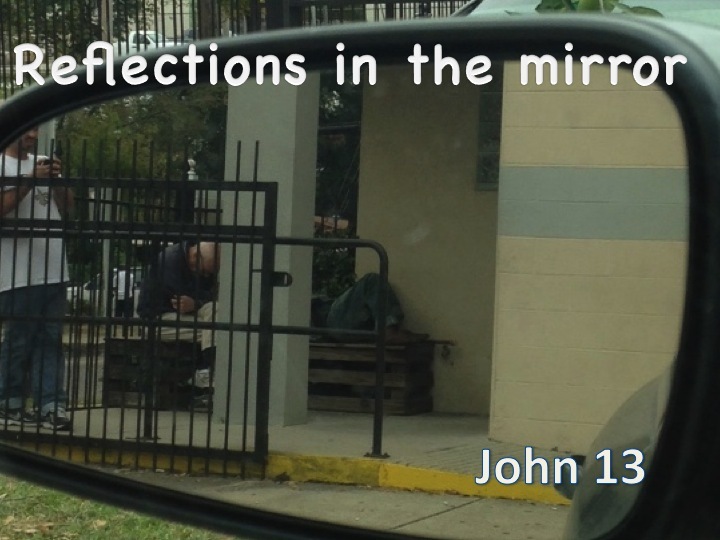 This was my view in the mirror of Dad sitting on the bench by his homeless friend. When I glanced at the side-view mirror and saw Dad sit down slowly—my Dad, 77 years old, does most things slowly these days—I saw myself wondering why I came on this errand. We just finished lunch with my brother where we talked about Dad’s retirement from his financial planning career, but before going home Dad wanted to go downtown to help a friend. His friend’s name was Ray, the same as my Dad’s name, but that is about all they had in common. Maybe I should have accepted his offer to drop me off at the house following lunch. I locked the car doors after turning off the car because although I saw my Dad in the mirror sitting calmly on the bench, I saw fear when I looked at myself. I know, I was sitting smugly in the car, and it was my Dad sitting out there on the bench, but he seemed more comfortable in the neighborhood than I did. We sat there for about 20 minutes waiting for the doors of the pharmacy to open. I listened to the NPR station dissect the ramifications of election week and what kind of policy changes we could expect from the new Congress. I wasn’t sure if any of those policy changes would reach the neighborhood that I was sitting in. But Dad was in the neighborhood and he was making a difference, at least in the life of this one man who needed a ride to pick up medicine. On the way over, Dad explained to me that Ray’s health is complicated because he has diabetes. I’ve never considered the homeless life of a diabetic. They disappeared from my view in the mirror into the community pharmacy—it wasn’t a CVS or Walgreens, but some kind of social services available. I listened to another interview on the NPR news, and soon enough Dad and Ray reappeared in my rear-view mirror as they approached the car. I had already moved our belongings in the back seat to clear a space for Dad’s friend. My sweater was back there and I didn’t want it to get dirty. When I saw them approach, I also saw myself. I saw my own anxiousness for Dad to join me in the passenger seat. I saw myself too eager for him to navigate me out of the neighborhood. When Dad opened the front door, I was relieved. Time to head home. He stepped aside, though, so that Ray could climb in the seat beside me. His friend, about my age but moving even slower than my Dad, eventually got situated. Now I looked in the rear-view mirror and saw Dad sitting in the backseat, and I saw myself wondering why he was back there and his friend was with me in the front seat. This man wasn’t my friend; he was Dad’s friend. I saw myself wondering how I would make small talk with the man sitting beside me. I saw myself too aware of how dirty he was and what he smelled like. Good thing Dad didn’t see me in the mirror. I had resolved that it was okay if I didn’t make small talk. We could listen to the news—although I doubt that Ray voted or cared much about who controlled Congress. It was my Dad’s friend who broke the ice before we even pulled out of the parking lot. “How many kids do you have?” he asked, and, “What are their ages?” I told him about my kids while he interjected instructions where to turn to get to Interstate 10. And we even talked about those LSU Tigers. The way he climbed out of the car, I agreed with his decline. I handed him the keychain that he left on the dashboard and wondered what doors the keys unlocked. By this time, I knew better than to look at myself in the mirror. I turned the car around; now Dad was sitting with me in the front seat. 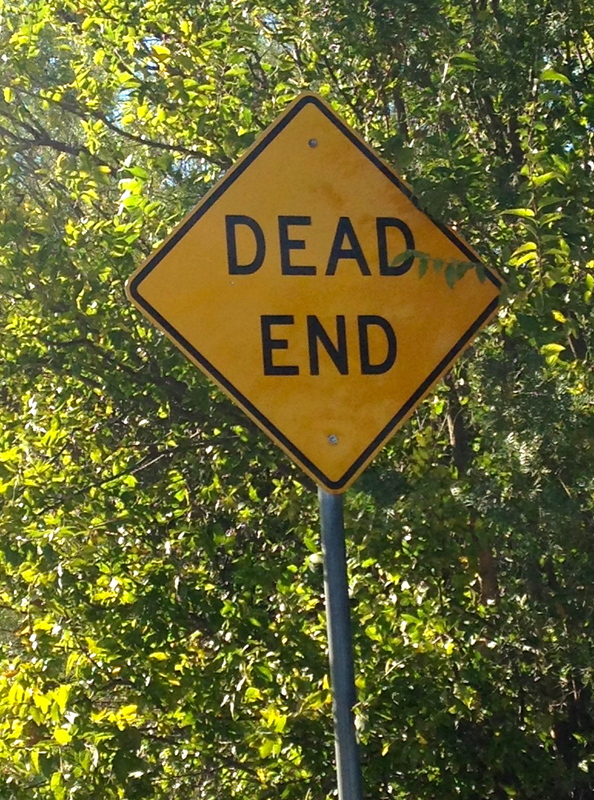 The dead-end street vanished in the rear-view mirror as we headed home. Dad explained to me that his friend found the abandoned home and received permission to stay in it. “There is no electricity or water, but he’s happy to have a roof over his head,” Dad said. I wasn’t going to look in the mirror to see how much it took for me to be happy. 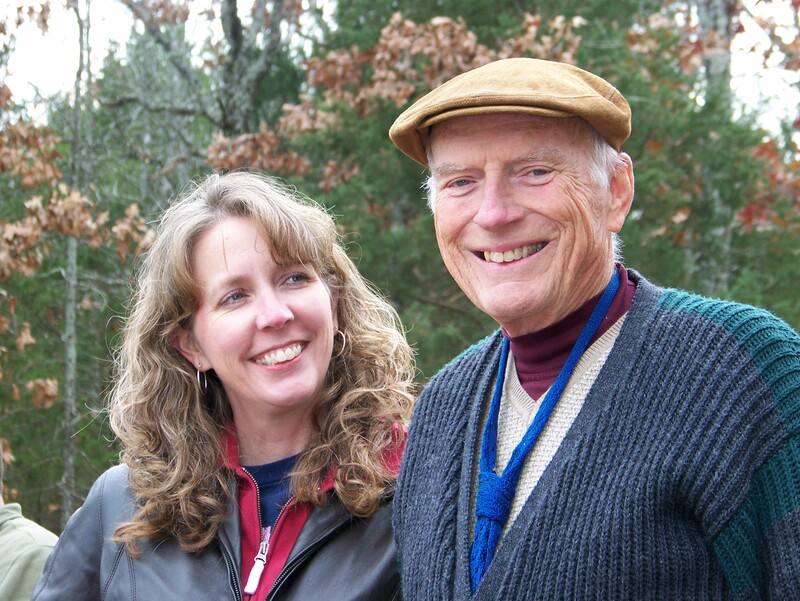 I did look beside me, though, and it was clear that Dad was happy–a little tired, but happy. He was happy to serve this man named Ray. And when I looked in the mirror at myself, I was happy too. I was happy to run this errand with Dad. I was happy because it reminded me that I’ve been watching Dad love others since I was a little girl. It’s gotten messy through the years, sometimes very messy, but Dad keeps loving. So I’ll keep watching, looking in the mirror and learning. Your dad sounds like a great man, and although you seem a little hard on yourself, I see you following his footsteps, loving people along your own journey.